Big Sky Pond Skim 2014!!! 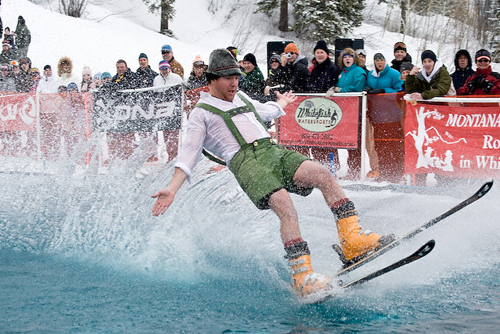 Another ski season coming to an end means another pond skim celebration at Big Sky Mountain Resort. The festivities will be going down this Saturday 4/19/14. Come and join the fun dressed in your funkiest outfit and have your chance at making it to the other side or simply enjoy the debauchery from the sidelines. Music, friends, sunshine and mountains sure is the recipe for a great a time! With only 45 minute drive from Bozeman, MT i sure hope to see you there!! Written by Greg Smith on April 15, 2014 . Posted in Living The Dream! !